I lived my professional life mainly in urban communities but I always knew, once retired, I would try to find a quieter location. A relative of mine, who lived in Southampton, recommended the builder who had built her bungalow. He helped me find a lot and agreed to build the house. Unfortunately he was unable to fulfill his promise. In search of a new builder I went to the Building Department in Port Elgin for advice. It was suggested that I look into the ICF (Insulated Concrete Forms) building technology, as it is very suitable for the lot I owned. Next I spoke with the Customer Service Representative of the Nudura Corporation in Barrie. She was very helpful and sent me valuable documentation, including a list of qualified installers. I met with Terry and was happy that he agreed to build a small home where I could “age in place”. I like this concept because it enables a senior to live independently for as long as possible. Having lived in the house for some time, I can now say that an ICF home was the right choice for me. I chose 9’ ceilings and large windows which made for a bright living space. I particularly like the peace and quiet, thanks to 6” concrete walls, sandwiched between fire retardant treated foam insulation, which act as a sound barrier. The heating and cooling system is integrated, and I can set the temperature to remain the same, day and night, for each season. The stability of the internal temperature, with fewer fluctuations, reduced drafts and cold spots, has made the house very comfortable and energy efficient. The house is built to last and can withstand winds of up to 400kmh. The attached garage where the temperature never goes below zero degrees, has become an extension of the house and is great for storage. Since the completion, Terry and his team of qualified and dependable trades people, who on many occasions went the extra mile, added a driveway, a deck and fence to my property. I had renovated two homes but this was a first. Building a new home is a very different experience. Terry reassured me that I could count on his support throughout, and for that I am very grateful. 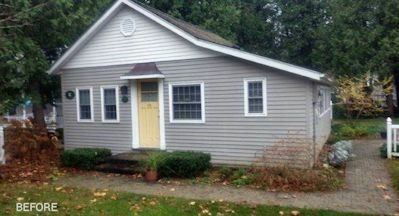 By building a house that allows me to age independently in my own home and that I am going to enjoy for years to come, Terry realized the plan I had in mind. We purchased our house 2 years ago thinking we would use it as a seasonal cottage but fell in love with Port Elgin, so decided to call it home. Living here full-time though, meant adding a bit more space and conveniences to take it from a cottage to our home. From the moment we met Terry and discussed our ideas for a small addition/renovation, we felt confident that he completely understood what we wanted. With his experience and expertise he helped us move from “ideas” to “a vision”. Terry and Tina have been nothing but supportive and understanding throughout the entire process! Not only were Dale’s tradespeople talented, they were courteous, polite and always willing to stop what they were doing to answer questions or listen to concerns. If they didn’t have the answer, Terry was called on-site immediately. Terry’s demeanor and attentiveness alleviated any concerns and always kept us calm. It was also evident that the contracted tradespeople were chosen for their high level of experience and customer service. Our project consisted of a mudroom addition with a covered porch, carport and cement driveway/sidewalk . Since completion we have received numerous positive comments, many from complete strangers who have said they watched the project with anticipation. We are so very pleased with the quality of workmanship and overall experience with Dale’s and consider ourselves very lucky to have found such a reputable contractor. 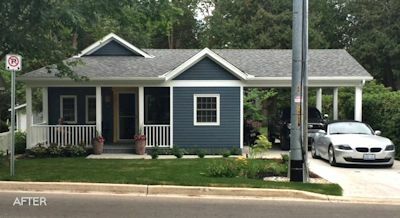 The Saugeen Shores Chamber of Commerce held its BRASS Awards Gala in June 2018. 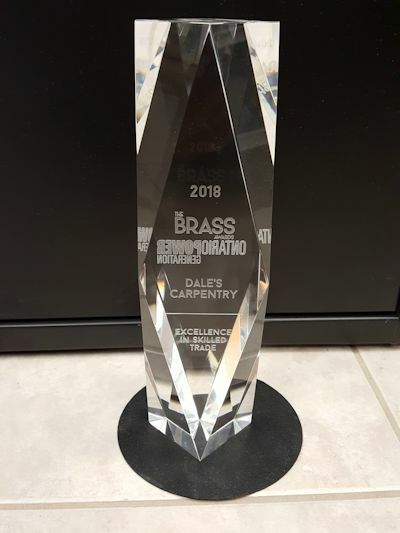 Dale’s Carpentry was presented the 2018 Business Recognition of Achievement Award for "Excellence in a Skilled Trade". Thank you to the Chamber and a special THANK YOU to our Crew as we could not have achieved this without you! We are pleased to provide this testimonial to Terry and Tina Chappell and all the staff at Dale’s Carpentry for their excellent expertise and workmanship. We engaged Dale’s Carpentry to remove our former cottage and rebuild a brand new structure using ICF to ‘turnkey’ completion in the Town of South Bruce Peninsula. From the very first meeting with Terry on site to the final ‘sign off’ our cottage build was professionally and competently managed. The sub-contractors selected were competent and completed their work in a timely manner. Indeed, from the start of the project to completion, Dale’s Carpentry staff were there when expected and completed the work according to the schedule as discussed and agreed upon. This despite dealing with unpredictable and wet weather. Communication with Terry was timely (usually within the working day) and responsive to any concerns or questions we may have had concerning plans, ongoing work, and construction challenges. He was patient in explaining the answers to all questions and he meant his statement that any question is an important question. He made every effort to listen and respect our position on plans and our thoughts during the build. In addition, we could talk directly to onsite staff who were also attentive and provided constructive advice. Terry very quickly sought our opinion when design changes had to be considered to accommodate cost management and technical challenges. Terry and Tina’s personal input and thoughtfulness allowed us to experience and enjoy our new cottage and also gave us an opportunity to hold onto memories of our past family cottage with a whimsical collection of artifacts incorporated into our new structure. My wife Nancy and I were particularly pleased with this approach and it showed a personal engagement in the project by Dale’s Carpentry. Nancy and I have no hesitation in providing a solid recommendation to Dale’s Carpentry for their customer service and responsiveness, expert knowledge and competent staff and project management. A great job and great people! Bob and I want to thank you very much for the addition to our cottage.We have had the cottage in the family for 40 years and were reluctant to sell because of all the memories it held. Bob decided to retire last year and we sold our house in Guelph and moved to Port Elgin permanently. We needed to expand and update the cottage. We called Dale's Carpentry and Terry, we told you what we wanted and you gave us a step by step quote that left nothing to guess work. We lived in the cottage during the renovations just blocked off the back wall where the addition was being added (except for a small window so we could watch). The quality and workmanship exceeded our expectations. The guys were amazing, so friendly and polite. They took time to explain what they were doing if we had any questions. A special thank you to Mike (who became George our dog's best friend) and the boys on the framing, and Shane and his helper for the foundation and the beautiful cement work, also Tom who did the excavations . We can't forget Gary on his advice and installation for the re-siding and trim of the entire cottage. Our addition and patio are beautiful. We now have lots of room for family and friends. Terry, you were so patient and always available if we had questions and/or changes. We would highly recommend Dale's Carpentry to anyone. Thank you again from a very happy customer! We appreciate the professional timely manner in which our modest cottage addition has been completed by Dale’s Carpentry. Ours is a small original Southampton building. Despite other contractors’ reluctance to meet with us, give us any basic advice or even risk suggesting time-lines or an estimate – our earliest dealings with you proved straight forward. You presented us with knowledge about building codes and construction essentials, paid attention to our un-cohesive ideas and readily engaged in brainstorming about home improvement possibilities for our space: both new and old. You offered advice that clarified our own agenda as well as expectations from a contractor’s perspective. You made yourself available throughout the entire process: the initial design stage with Dan Murawsky, hooked us up with excellent local companies – Jody at Georgian Bay Windows, Jason at Climate Clinic – and gave us no-nonsense advice that consistently met our expectations. Sourcing local reliable tradespeople would have been impossible for us so we followed your guidance. You took care of all the ongoing details, contacting us if issues or questions arose. We are pleased with the quality of workmanship as well as the choices you needed to make on our behalf. We’re thrilled to have our unique family space to enjoy this summer. We consider ourselves fortunate to have had the opportunity to work with you and your lovely, super-organized “office manager”/wife, Tina. We would highly recommend Dale’s Carpentry as a company to consider when planning a building project. Terry Chappell was the General Contractor for the recent renovation of my family cottage on Francis Lake. The original cottage was built in 1960 with an addition completed in 1977. The first thing that impressed me with Terry occurred on the first meeting. The two other contractors I met with gave me estimates based on their first visit. Terry, however told me he would review the carpentry needed but wouldn’t give me an estimate until we met a second time with his sub-contractors (plumbing, electrical and gas fitter). Terry was also the only one that suggested we tear down to the studs since there was some mould in the 1960 portion of the cottage. He also was the only one that noticed the dip in the floor and suggested putting in extra support beams in the crawl space. All three sub-trades provided me with good information during that second visit which is why I chose to go with Terry. The work on the cottage was done in a timely manner with great co-ordination of the sub-trades by Terry. Many of the individual projects have certainly delighted me and exceeded my expectations. The many suggestions from Terry and his carpenters made were a huge improvement over the original design. Some examples were the large glass windows facing the lake, going with vinyl siding rather than wood, the board and batten finish on the garage walls, to mention a few. Some other examples include the stone work inside and out, especially the fireplace. The old rustic piece of ash that Terry’s carpenters used to make the mantle looks amazing and Kevin, one of Terry’s carpenters was able to make me an awesome bench for the foyer from the leftover wood. Another example is the new roofline in the original cottage which provided much more height for kitchen cabinets and bunkbeds in one of the bedrooms. Other features such as the new wet bar and the expanded deck look amazing. I have a background in quality from my work experiences and one of the key phrases in customer satisfaction surveys is to “delight the customer”. I certainly have been delighted with the total renovation of my cottage and as mentioned earlier my expectations were exceeded during this process. I would not hesitate to recommend Dale’s Carpentry to any of my neighbors. Hey Terry, I just wanted to send a quick email thanking you and your amazing crew for the work you did building our gorgeous fireplace mantel and shelving units. You guys took a simple idea we had concerning a fireplace mantel and shelves and made both the fireplace mantel and shelves not only exactly what we wanted but also so beautiful and just beyond what we expected. To say we are thrilled is a complete understatement. Your crew of guys were professional, funny, listened to any ideas we had but also answered any questions we had without making us feel like we were wasting their time. We cannot say enough good things about Dale's Carpentry. We have told everyone if your ever need anything done to call you guys. Even if you had to wait it would be 100% worth the wait. When we need anything else done at our house the first and only place we will be contacting is you guys at Dale's Carpentry! So thank-you guys again so much!!! 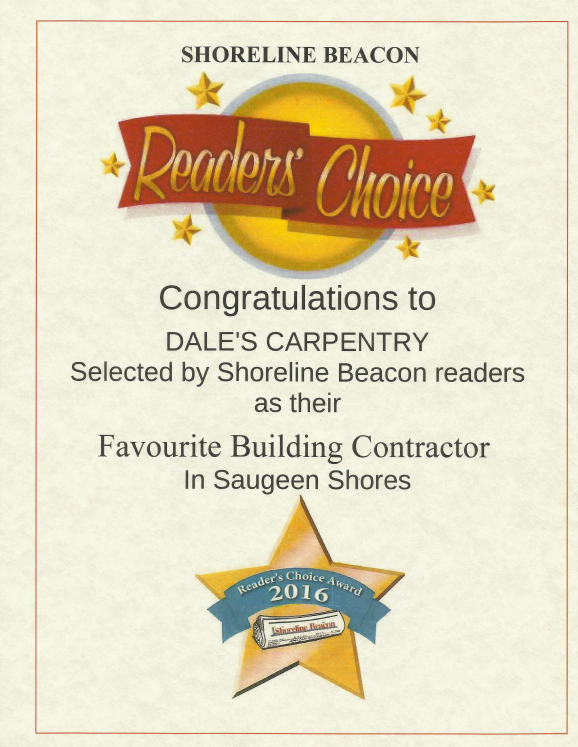 Terry and the Dale's Carpentry Crew would like to thank everyone for selecting Dale's Carpentry as their Favourite Building Contractor for 2016. 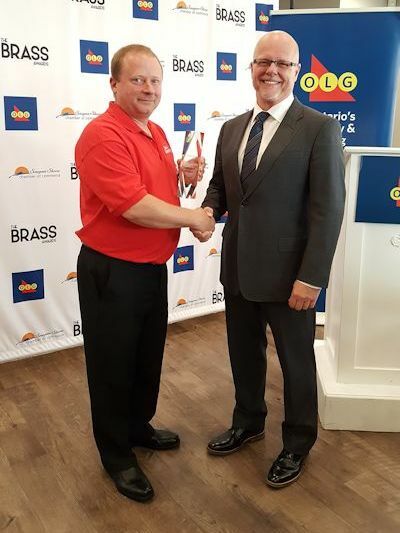 Dale's Carpentry was nominated for the BRASS Service Excellence Award in 2015. We had a family cottage built in the early 60’s. It is beside a creek and across the road from Lake Huron. We found out because of the creek, at some point our property was deemed an environmental hazard. As my family was the original owners, I was allowed to take the old pre fab cottage down and build a home with some restrictions. If I sold the place, the new owners would only be allowed to fix up the inside of the place and they would not be allowed to change the footprint. I had a contractor that I was working with but was running into so many problems before we even started that I contacted Dale’s Carpentry and after one meeting I felt so much relief. Terry knew the rules and regulations of what I could and what I couldn’t do at the county, conservation and town levels. He and his staff were great in their suggestions to an alternate plan from what I wanted so that it would be approved by the three levels of government. The different stages of taking down the old cottage and building the new one was done on time and he stayed very close to my budget. Extra fees etc. were from the three governments, not from Dale’s. We have a beautiful large home that suits my needs and guests are very impressed. A number of things like trim and baseboards were going to be done by my husband but he took sick and died this pass November. Terry has always been willing to work some of the smaller jobs into their schedule that would have been done by Bryan. Even though their job is done, he is always available to give me suggestions and help when I needed them. His staff and sub contractors that worked on my place were professional, free with information on their work and as some of my guests have stated, did an excellent job in every step of the way. I have no hesitation to recommend Dale’s Carpentry for any job, big or small. We want to express our sincere appreciation for the wonderful job that you done on our basement renovation. We are extremely pleased with your suggestion about replacing the electric baseboard heaters with a natural gas HVAC unit. We are already noticing a cost savings. The crew was very professional and thoughtful. It was a pleasure to have them in the house. The workmanship by all the trades was excellent. Please feel free to have any future clients contact us or have them drop in to see the basement. We would like to thank you very much for the renovations to our home last summer. Everyone that has been in our home has commented how it has opened up the house and how good it looks. Both Mary Lou and I appreciated the time that you spent and suggestions that you made. We both appreciated the time that your staff took explaining any of the questions that we had when we dropped in to see the progress. Each of the other trades (electricians, plumbers, flooring, cabinetry and painter) that you brought in for the renovations were professional and treated us respectfully when we asked questions. Lori from Home Hardware was extremely helpful with the selection of kitchen cupboards, counter tops and hardware for the kitchen. We have and will always recommend you as a contractor. If ever a situation presents itself that someone would like a reference or would like to see the quality of your work, you may use our names a reference. comment repeatedly on the workmanship throughout. same qualities as a constant reminder of the basis of which your business was formed.